This is electronics at a nearly unfathomable scale. Transistors are semiconductors that work as the building blocks of modern computer hardware. Already very small, smaller transistors are an important part of improving computer technology. That’s what a team from the Department of Energy’s Lawrence Berkeley National Laboratory managed to do, according to a study published in the journal Science. Current transistors in use are in 14nm scale technology, with 10nm semiconductors expected in 2017 or 2018, supposedly in Intel’s Cannonlake line — a trend following Intel co-founder Gordon Moore’s prediction that transistor density on integrated circuits would double every two years, improving computer electronics. Berkeley Lab’s team seems to have beaten them into it, developing a functional 1nm transistor gate. 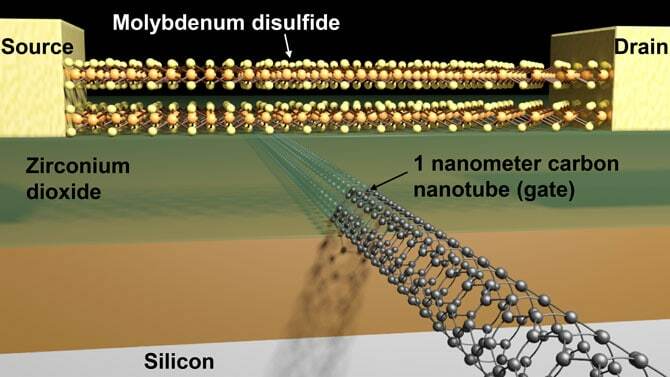 The Berkeley Labs team found a better material in molybdenum disulfide (MoS2). Electrons flowing through MoS2 are heavier, making them easier to control even at smaller gate sizes. MoS2 is also more capable of storing energy in an electric field. Combined with carbon nanotubes with diameters as small as 1nm, this allowed for the shortest transistors ever. “However, it’s a proof of concept. We have not yet packed these transistors onto a chip, and we haven’t done this billions of times over. We also have not developed self-aligned fabrication schemes for reducing parasitic resistances in the device,” Javey admits. Still, its foundational work that keeps alive Moore’s Law a little longer.